Last week, when gushing over flip cards like Search for Azcanta, we hadn’t yet had the opportunity to see the red member of the cycle. Is Outpost Siege where we set the bar?The most obvious point of comparison for this new card is Outpost Siege. For its part, Outpost Siege served every role from “main-deck four-of in R/W aggro” to “sideboard role player competing with its day’s Chandra at the four”. 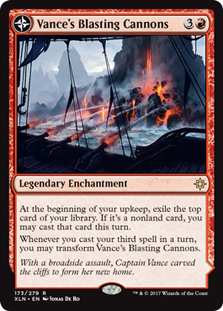 Regardless of how you want to slice it, Outpost Siege was a stronger card than Vance’s Blasting Cannons (at least the front side). 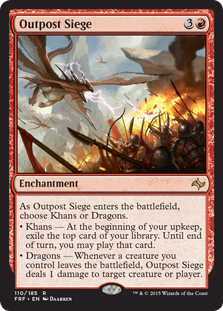 Outpost Siege had two different modes: Not only was it a potential source of incremental card advantage over time, the “Dragons” setting was a way to win. Outpost Siege allowed you to play both spells and lands as extra resources. Vance’s Blasting Cannons is kinda sorta only 60% of an Outpost Siege (again, with half the options). So 30-33% on its face? How annoying would it be to reveal a land (that you can’t play) and then not draw a land (when you need one)? Gross, right? But the bar isn’t whether this is better or worse than Outpost Siege in the abstract; the front-side is pretty much worse. The question is if it is good enough to play anyway. The aforementioned 30-33% of an Outpost Siege: This card is a source of incremental card advantage that pays off only after you’ve untapped successfully with it in play. More than that, it really only pays off after multiple turns. 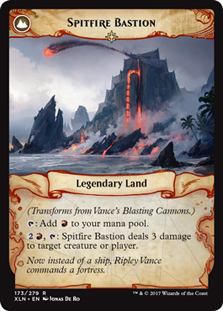 Spitfire Bastion is a source of inevitability, not unlike fellow land Ramanup Ruins. Decks like U/R Control, for example, can’t allow this to flip, because no matter how well they close out on creatures, they will likely lose the game three life points at a time. Mike — ever fearful of Kor Firewalker — points out that as a colorless source of damage, Spitfire Bastion can kill the hell out of Protection from Red creatures. So what do you think about this last transformer? The Top Level Podcast boys revisit some of the others and a whole mess of Ixalan cards in this week’s episode.